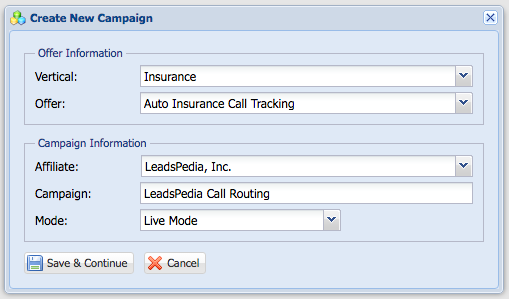 There is more than one way to create a call routing campaign. 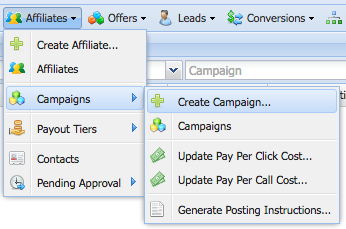 You can create a call routing campaign from the main menu, the affiliate window and the offer window. This article will walk you through creating a campaign from the main menu. You cannot create a campaign if you don't have the (Vertical, Advertiser, Offer and Affiliate) created. The Default Campaign Settings are inherited from the offer, however; you can override the offer settings after you create the campaign. The Create Campaign window will open. Campaign: Give your campaign a name. Mode: The Offer visibility in the Affiliate Portal. Setup: No Calls will be routing until you're done setting up your campaign. Test: All incoming calls will be marked as tests and won't show in reports. Live: You're done with setting up your campaign and good to go.